Anyone interested in seeing how local residents are responding to two national petitions to remain in or leave the EU can check the latest figures on the government website. By 3pm on Friday 22 March, 5,417 people in Welwyn Hatfield (4.89% of 110,750 constituents) had signed the national petition to revoke Article 50 and remain in the EU. So far 548 people (0.49% of constituents) had signed a petition to leave the EU without a deal. When the EU Referendum was held on 23 June 2016, the results from Welwyn Hatfield were 31,060 (53%) in favour of leaving the EU, with 27,550 (47%) voting to remain. The turnout was 58,641 (75.08% of the electorate). The petition to remain in the EU is on the UK Government and Parliament site and is called Revoke Article 50 and remain in the EU. When the results are in there are two possible outcomes as set out on the site. Another petition with the title Leave the EU without a deal in March 2019 has drawn 548 signatures, 0.49% of the population of Welwyn Hatfield. 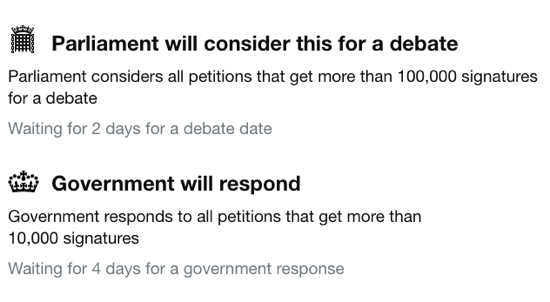 That petition resulted in a debate in Westminster on 14 January 2019. Those who click on either of the petitions need to confirm their intention by clicking on a return email.